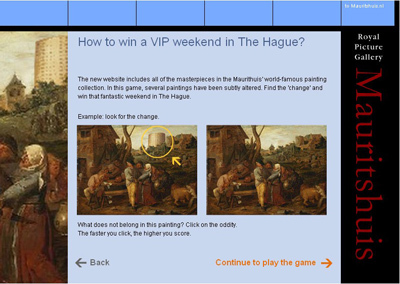 In November 2005, the Royal Picture Gallery Mauritshuis was the first Dutch museum to launch an interactive, viral buzz campaign. The museum used it to draw attention to its new Web site in a playful way. The campaign was an experiment, because even though the business community has long been exploiting the potential of viral buzz marketing to the full, the use of these techniques is still quite uncommon in the museum world. Many cultural institutions still tend to think in terms of traditional marketing methods which they are eager to keep, in line with their house style and cultural image. The Mauritshuis took its chances and reports on its findings in this case study. The article starts with the underlying theory. What is buzz and viral marketing? What value does this form of marketing add for museums? Subsequently, the Mauritshuis campaign is described in more detail. What was the idea behind the campaign? What was the museum aiming at with this campaign? What went well and what could have been better? And most of all: would we recommend it to you? Museums have a great deal of experience with marketing and approaching target groups. In recent years, they have started exploring the potential of new media. Almost every museum has a Web site, uses electronic reservation forms and has an electronic newsletter. But there are many more possibilities. Buzz and viral marketing in particular offer a host of opportunities. In contrast to museums, the business community is already fully capitalising on them. Many cultural institutions still think in terms of traditional marketing methods which they keep in line with their house style and cultural image. The Mauritshuis took its chances and became the first Dutch museum to launch a viral buzz campaign. Marketing magazines are brimming over with articles on buzz and viral marketing, but what do these terms actually mean? Anyone doing a little research will soon discover that opinion is divided. Every marketer seems to have a personal definition. Nevertheless, they all agree on one thing: both techniques use consumers to advertise a product, brand or service. Buzz is generally regarded as a controlled form of good old word-of-mouth advertising. It is based on the fact that people have the most faith in personal recommendations from friends and acquaintances. After all, what is better advertising than satisfied customers of their own accord telling others about your products? Buzz marketing tries to control this process. The degree to which this is really possible is, however, open to debate. Some (Sodderland 2005, Loeffen, Oosterwijk 2005) see the starting point as the marketer’s only opportunity to exert influence. Others (Salzman 2004, Allard 2006) feel that marketers can also exercise a considerable degree of control over the path followed by word-of-mouth advertising. No matter how much experts may disagree on this, the hype around the film The Blair Witch Project and the Harry Potter books demonstrates that much is to be gained by an effective buzz campaign. Viral marketing should be taken literally as a virus. Using this technique, marketers have the consumer spread the word about a product. It often works like the old chain letter which we used to pass on in our schooldays. Prizes, practical jokes or shocking content are aimed at encouraging people to pass on information. A few years ago, Hotmail proved that viral marketing does not have to be complicated. To promote its free e-mail service, they added the line ‘Get your free e-mail at Hotmail.com’ at the bottom of each e-mail message. Within eighteen months, 12 million users had registered (Creemers 2004). Now, is the line at the bottom of a Hotmail message an example of viral marketing, a form of buzz marketing or both? Did Hotmail users not tell one another something via the line under the body of their e-mail message? This is the crux of the issue of how to define buzz and viral marketing. Some experts (Salzman 2001, Creemers 2004, Nucifora 2005) regard viral marketing as a handy tool to boost the buzz. Others (Sodderland 2005, Bakker 2005, Allard 2006) classify it as a different marketing technique. To them, buzz marketing is about the product itself, whereas viral marketing is built around a side issue - a funny film or campaign. The Mauritshuis views buzz and viral marketing as two mutually reinforcing components and therefore deliberately combined them in their campaign. Buzz and viral marketing are not new. The techniques have been employed successfully for years, but nowadays information technology offers the potential to make viral buzz marketing far more profitable. The Hotmail example cited above proves that the Internet and e-mail are ideal means for distributing a message rapidly across the globe. And the consumer - the principal link in every buzz campaign - uses both on a daily basis! For example, a recent study (Salzman 2004) has demonstrated that 70% of the people receiving a URL from a friend forward the e-mail containing the hyperlink. Over 64% use e-mail to share or receive information about a product or service. An additional advantage of ICT-controlled viral buzz marketing is that it often costs substantially less than traditional marketing forms such as advertisements in glossy magazines or on TV (see Salzman 2004 for figures). Even simple e-cards and tell-a-friend functionalities have proved to be effective viral marketing tools. Techniques such as personalisation make it possible to draw up a standard message in such a way that it comes across as specially intended for that one, unique customer. Moreover, it often takes considerably less time to set up an interactive campaign than an advertising campaign, enhancing a company’s clout in the rapidly evolving knowledge society. Starting with experiments by the fashion and film industry in around 2000, buzz is now being used by more and more companies. Brand managers at leading companies already consider it as part of the standard toolkit. Experts (Khermouch and Green 2001, Salzman 2005, Kirby 2006) predict it will become a campaign fixture. SMS texting, blogs, on-line communities and chat rooms present new opportunities for marketers. Imagine a group of people on the Internet who share a particular interest. If you could use them to tell each other good stories of your product, what could be better? Interactive viral buzz marketing has already proved its worth in campaigns run by the travel industry, a sector that has the same tourist target group as many museums. Word-of-mouth advertising is a quality mark in this sector in particular. After all, many consumers pick their holiday destination, restaurant or day out on the basis of personal experiences from people they know. Buzz uses and amplifies this approach. Museum campaigns, too, have used this psychology for years. Loyal customers and societies of friends are the first to receive invitations to new exhibitions for this reason. Museums cannot wish for better advertising than their enthusiastic stories. Yearly visitor polls give proof that this strategy is effective. For example, over 20% of the visits to the Mauritshuis are triggered by enthusiastic stories of acquaintances; 30% of the visitors between 16 and 30 years old are ‘buzzed’ to the museum (Horst 2003, 2004, 2005). Also, this form of buzz marketing is one of the main explanations for the hypes around the Vermeer exhibitions in The Hague/Washington in 1995/6 and New York/London in 2001 and the blockbuster exhibition Van Gogh & Gauguin in Amsterdam/Chicago in 2001/2. Although museums have ample experience in the area of buzz marketing, they hardly take advantage of the possibilities that ICT offers them in this respect. Inspired by the successes of the recent KLM campaign (see fig. 1) and other examples, the Mauritshuis was the first museum to risk an experiment with interactive viral buzz marketing. The Royal Picture Gallery Mauritshuis is an internationally oriented museum that displays a worldrenowned collection of paintings. It houses top-quality work by all the great masters of the Dutch and Flemish Golden Age in a 17th-century city palace: Vermeer, Rembrandt, Rubens, Frans Hals, Jan Steen, etc. Every year the museum receives about 200,000 to 250,000 visitors. Approximately 50% of the visitors come from abroad, particularly Western Europe, North America and Japan. The relatively small staff of 40 use every conceivable means to inform potential visitors. Since the Internet is becoming an increasingly important tool to serve an international public, the museum launched a completely new Web site in November 2005. To allow a broad audience to familiarise itself with the new site, the museum organised a compact but intensive campaign that drew heavily on digital media. At the heart of the campaign was the development and implementation of a buzz marketing campaign based on the idea that potential users of the site are used to such multimedia forms of communication. In addition, existing means - both digital and analog - were used to enhance easy recognition of the message and the sender. The museum set up the viral buzz campaign to achieve a number of objectives that are harder to attain using more traditional PR instruments. Making the new site public.Since the site and its potential users are on the Web, the museum decided to use primarily new media in its launch campaign. If people are alerted to a site by e-mail or related media containing a hyperlink to the site, they are likely to click the link and get directed to the site. The percentage of people who take the trouble to visit a site advertised in a paper medium is demonstrably smaller. Improving name recognition of the Mauritshuis on the Internet In addition to regular museum customers, the Mauritshuis also wanted to reach active Internet users who are not by definition prone to visit a museum site. They may, however, be receptive to on-line games. The museum hoped that the viral buzz campaign in particular would enable it to stand out on the immensely large Web where there is so much to do already. The underlying idea was to achieve a higher search engine ranking. Recruiting new, regular and repeat customers for the site and the museum.The core of the new Web site is the Collection section (see http://www.mauritshuis.nl/index.aspx?ChapterID=2339), in which all the paintings can be viewed and explored in numerous ways. This part was specially developed to encourage visitors to revisit the site and the museum. The main goal was to trigger not only people who are already keen on visiting museums, but also new visitors triggered by the campaign and the site itself. Thus, the launch campaign focused on promoting this interactive section of the site. Improving the image of the Mauritshuis Many people still labour under the misconception that a museum visit must always be useful or instructive. The buzz campaign was clearly set to portray the Mauritshuis as a modern, easily accessible organisation. Therefore the museum deliberately opted for this playful campaign involving a little bit of self-mockery. It was expressly not the museum’s purpose to use the campaign to collect e-mail addresses. Often, one of the requirements for participating in such a campaign is that candidates enter an e-mail address for an electronic newsletter. At first glance, this seems a quick and easy way of building a database. However, the Mauritshuis has serious doubts about the long-term effects of such an approach, as the participants are not genuinely interested in receiving museum information on a regular basis. Mailings are often unwanted and a major source of irritation and can be particularly harmful to the museum’s image. The objectives of the buzz campaign gave rise to a number of preconditions. The museum was bent on a playful, light-hearted campaign that was to appeal to both regular and new customers and Internet users. That is why the museum opted for a game, but one with substance, because women and senior citizens - the museum’s primary target groups - prefer to do mind games and puzzles (Salzman 2004, Sonnemans 2006, Tomesen 2006). To promote the core of the site, a game was designed around the permanent collection and named the Gallery Game. Under the motto of ‘the site has been renewed but we got a little bit carried away’, a number of paintings were ‘embellished’ with a contemporary element. For example, Johannes Vermeer’s world-famous Girl with a pearl earring was given a piercing that many of her 21st-century counterparts wear (see figure 3). These types of anachronisms gave participants a different view of the museum. The humour and self-mockery prompted them to pass on the game or play it again. Some found the anachronisms somewhat shocking. On seeing the pierced Girl, an elderly player exclaimed, ‘Poor girl!’, but this did not keep him from telling friends and acquaintances about the game: an excellent example of buzz. Qualities such as fun, play or instruction are not enough to make a game buzz, so the museum decided to incorporate an incentive. Players of the game could win a particularly attractive prize: an all-inclusive VIP weekend in The Hague, including a visit to the Mauritshuis, of course. The museum had five such weekends for the top five players, but these prizes were not given away lightly. Players were shown five small images of paintings, one of which contained an anachronism and therefore did not belong (see figures 4 and 5). The less time it took players to detect the ‘error’, the more points they could win. They were shown five series of five paintings each. This resulted in a total score, which was matched to a scoreboard showing the top ten scores (see figure 6). If players wanted to play the game again, they had to enter three friends. Once one of them had played, they would receive another invitation (i.e. an additional chance) to play the game. We incorporated this viral aspect in the hope of increasing the buzz around the game (and the site). This entailed a particularly complicated formula for the scores, as the campaign lasted only two weeks. Anyone joining in later still had to have a fair chance of winning the prize in this short period of time. It was also necessary to take measures to prevent cheating. To this end, several anti-hacking systems were built in, and it was impossible to play the game several times under the same name or the same e-mail address. How To Start The Buzz? Subscribers to the Mauritshuis e-bulletin (approx. 1,200) These are regular customers, who had shown an interest in the Web site and the museum through their subscriptions. Business contacts of the Mauritshuis (approx. 2,650) A selection of people with an interest in the collection, education, PR or marketing was made out of the museum’s large contact database. Personal contacts of staff (approx. 450) This was a risky experiment. For the first time ever, the museum deliberately used staff for a PR campaign. All staff were asked to think of friends and acquaintances who might be interested in the game. Responding with unexpected enthusiasm, they generated a total of 450 addresses. Measurements revealed that this target group comprised many keen participants in the game. 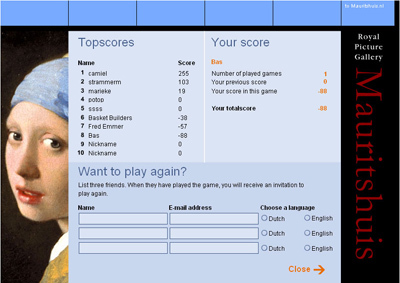 From the start on 15 November 2005, the game also featured prominently on the Dutch and English homepages of the Web site in the form of a flashing button. All in all, the museum sent invitations to play the game to over 5,250 e-mail addresses. The number of people actually reached was smaller (approx. 4,500) though, as some players received an invitation at both their work and private e-mail address, causing them to be listed under business relations and personal relations or e-subscribers, respectively. In the course of Tuesday, 15 November 2005, each of the above buzz agents received an electronic invitation to play the game. The mailing was deliberately sent in the middle of a weekday, as experiences with the Mauritshuis electronic newsletter had revealed that that is the prime e-mail reading time. People have worked their way through the weekend mail, have done enough work to take off some of the initial pressure and are ready for something fun. In general, the Mauritshuis is very satisfied with the results of the campaign. Of the initial 5,250 e-mail addresses contacted and the people they forwarded the game to, 68.6 % actually played the Gallery Game. This figure is substantially higher than the average 55-65% response to an Internet game, according to experts such as Sonnemans (Sonnemans, 2006). Taking account of the fact that many people received the invitation at multiple addresses and only activated the invitation at one, the pick-up rate is even higher. Dutch speakers proved to be particularly active participants. Of the 3,600 unique players, 93.1% had an .nl or a .be e-mail address. It is quite likely that they, more than foreigners, were enticed by references to the game and the new site in other elements of the launch campaign, such as the free bookmark. The effect of the buzz can clearly be seen in the daily graphs (see figure 9). The two major peaks occur right after the start (the primary players) and in the middle of the game period (people who were told about the game or got an invitation from a primary player and primary players who were given a second chance). The last few days once again show an upward trend, probably due to people deciding to take a chance after all or to take one last chance of winning the prize. The viral effect proved harder to measure. A comparison of the number of e-mail addresses available for the initial mailing to the total number of e-mail addresses available at the end of the campaign reveals that 2,967 new addresses were sent in. This means that every player introduced 4.8 new players; not a bad score compared to the 2-3 benchmark employed by experts such as Sonnemans or Salzman. The new players were supplied by a limited number of particularly active participants: there were only 134 players who played the games several times, most of them more than 10 times, some of them even more than 25 times. The site statistics (figure 10) clearly show the great success of the campaign as well. During the launch period, the new site was visited twice as often as the old site was. After the game, visitor statistics still exceeded those of the old site, but were much lower than during the game period. As the rest of the campaign was fairly modest, it is unlikely that this exponential rise is to be attributed solely to the advertisements or the banner on the façade, but is very likely the result of the buzz campaign. From the dozens of personal reactions that we received, we also learned that many non-players came to visit the new site after the game had come to their attention. The game generated a lot of free publicity. The buzz was picked up by the media, as the following examples illustrate. Immediately after the launch, an article appeared on Molblog (a popular marketing blog), the popular AD Haagsche Courant devoted a full page article to the launch, and the trade journal Adformatie covered the campaign extensively. This gave a positive impulse to the Mauritshuis’s image. In all honesty, reconsidering afterwards, we have to admit that we could have done a better job in certain areas. The less successful elements were partly due to our lack of experience, partly to the short time span (approx. 8 weeks) in which the entire campaign was developed, and partly to sheer bad luck. To mention an example, something went horribly wrong at the stage of the crucial invitation e-mail. As a result of human error on the part of the developer, all 5,250 buzz agents received a standard e-mail from the ict company instead of a personalised e-mail in Dutch or English from the Mauritshuis. Some people thought it was spam mail because they did not know the sender or suspected the impersonal English message of being a virus. This cost us many participants. The setup also proved too complex. Each game consisted of five rounds. This meant that players had to spot the mistake in five series of five paintings, and many found this too time-consuming. This was the most frequently given reason for bailing out. In our enthusiasm, we lost sight of the purpose of the game. The buzz campaign would probably have had a wider reach if we had limited the game to one simple round. In spite of extensive tests, the game appeared to contain a few technical errors, the hot spots in each image being a particular case in point. By clicking them players could win (i.e. clicking the anachronism), or lose points (if clicking an item that was a genuine feature of the painting). However, the hot spots proved too small and often responded too slowly. As a result of these technical shortcomings, many people were unable to play the Gallery Game properly, even though they understood the rules. As this made it possible for people to lose more points than they earned, they got frustrated, not conducive to the viral effect. Unfortunately, we were unable to increase the size of the images in the short playing period. We did adjust the hotspots on day two, and this immediately had a positive effect, boosting the playing frequency dramatically, as can be seen in the graph showing the number of players each day (figure 9). The response from participants, relations and (interactive) media was positive, and made us realise all the more that we could have used blogs, chat rooms and other interactive intermediaries in the campaign even more effectively. Unfortunately, the two-month preparation period was too short for this, but we hope to be able to make optimum use of this in a next campaign. The viral buzz campaign was a successful experiment for the Mauritshuis. It proved an ideal way of promoting our new Web site, improving our image as an accessible museum, as well as reaching people other than regular museum visitors. New developments such as blogs and text messages offer even more opportunities to create a buzz quickly in the nearby future. Make sure that the product is in fact ‘buzzable’. Is it fun, unique, exciting or playful enough to make people talk about it? Is it presented in the form of a message or medium that people are keen to pass on to others? Keep it simple. The viral buzz campaign is a ‘tool’, not a goal. Everything is possible in the magic world of ICT, but is it necessary for your campaign? Combine the buzz campaign with a broader campaign. Like most marketing techniques, a viral buzz works best if people are confronted with it via various media. Incorporate a good incentive. People are greedy. If the prize is attractive enough, they will be keen to enter. Do take into account that people create fake e-mail addresses to be able to play again. Also watch out for other cheats, such as hackers. The effects of a viral buzz are hard to measure, but the techniques are getting better and growing in number (Snyder 2006). Buzz campaigns are ubiquitous. Sources of inspiration include www.culture.buzz.com, http://www.vbma.net/about.html, http://www.womma.org/, http://viral.lycos.co.uk http://buzz.yahoo.com. Commercial companies have been making optimum use of the viral buzz for several years now. The Mauritshuis pilot project proves that, despite teething problems, museums stand to gain a great deal from viral buzz marketing. As museums have limited budgets and already recruit the majority of their visitors by means of ingenious forms of word-of-mouth advertising, it may be one of the most suitable ways of advertising in the future. Allard, S. (2006). Myths and promises of buzz marketing. In Kirby, J., P. Marsden (Eds. )., Connected Marketing. The viral, buzz and word of mouth revolution. Oxford: Elsevier Ltd, 197-207. Bakker, J. (2005). Estafettecolumn: experimenteer met viral marketing. http://www.emerce.nl/nieuws.jsp?id=428106. Consulted 21 January 2006. Creemers, T. (2004). De buzz rond buzz marketing. http://www.communicatiecoach.com/vakgebied_strategie_art_buzzmarketing.htm. Consulted 15 October 2005. Went offline in January 2006. Eilander, E. (2005). Virale marketing Mauritshuis. Molblog, 15/11/2005. http://www.molblog.nl/reacties.php?nieuws=1520. Consulted 18 January 2006. Horst, F. (2003, 2004, 2005). Publieksonderzoek Mauritshuis. Amsterdam: TSN NIPO. Khermouch, G., J. Green, (2001). Buzz Marketing. Suddenly This Stealth Strategy Is Hot—but It’s Still Fraught with Risk. In Business Week Online, July 30, 2001. http://www.businessweek.com/magazine/content/01_31/b3743001.htm. Consulted 16 January 2006. Kirby, J. (2006). Conclusion: the future of connected marketing. In Kirby, J., P. Marsden. (Eds.). Connected Marketing. The viral, buzz and word of mouth revolution. Oxford: Elsevier Ltd, 267-274. Mauritshuis ‘buzzt’ voor website. Veertig topstukken van museum tot in detail te bewonderen. AD Haagsche Courant, 18-11-05. p. 36. Mirck, J. (2005), Tussen kunst en kassa. In Adformatie. Weekblad voor reclame, marketing en media 33, nr. 50(15 December 2005). 38-40. Nucifora, A. (2005). Keep up with the Buzz on Buzz Marketing. http://www.nucifora.com/art_203.html. Consulted 21 January 2006. Salzman, M., I. Matathia, A. O’Reilly (2004). Buzzmarketing. De meest effectieve manier om uw klanten te bereiken. Den Haag: Academic Service. Sodderland, W. (2005). De beste Marketeer 2005: de consument. Consument als doorgeefluik en partner in je reclame. http://www.frankwatching.com/archive/2005/10/14/beste_marketeer_2005_de_consum. Consulted 20 January 2006. Sodderland, W. (2005). De consument maakt zelf de beste buzz. Molblog, 10/12/2005 www.molblog.com. Consulted 10 January 2006. Snyder, P. (2006). Buzz monitoring. In Kirby, J., Marsden P. (Eds.). Connected Marketing. The viral, buzz and word of mouth revolution. Oxford: Elsevier Ltd, 119-128. Tomesen, R. (2006). Met casual games geld verdienen aan vrouwen. Emerce 30-1-06. http://www.emerce.nl/artikel_print.jsp?id=1102236&rid=16566&site=247. Consulted 30 January 2006.